Being totally transparent, I was a bit scared to choose a cabinetry style. My biggest concern is the risk that we would choose something that feels dated in a few years or too much of a trend — especially because new cabinetry is such a big portion of any renovation budget. I went into this project without many opinions as to which type I prefer or if I even wanted wood or color finish! When Sarah presented her Tuxedo kitchen plan, I immediately knew it was right for us and our home… and felt an immediate sense of relief that we could keep it simple and go with black and white! But then it became question of which cabinet door style to choose. 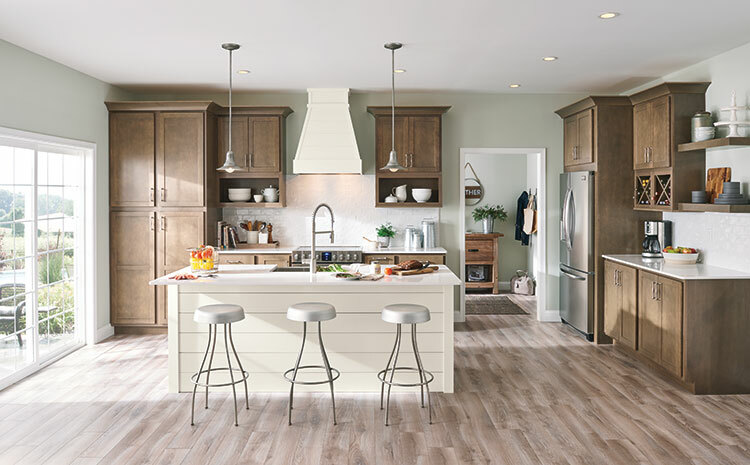 Our sponsor, MasterBrand Cabinets, has numerous options to choose from under several semi- to fully-customizable product lines, so we took an afternoon to scroll through and pick some favorites. I almost feel like an expert in cabinet styles at this point because I’ve looked at so many. 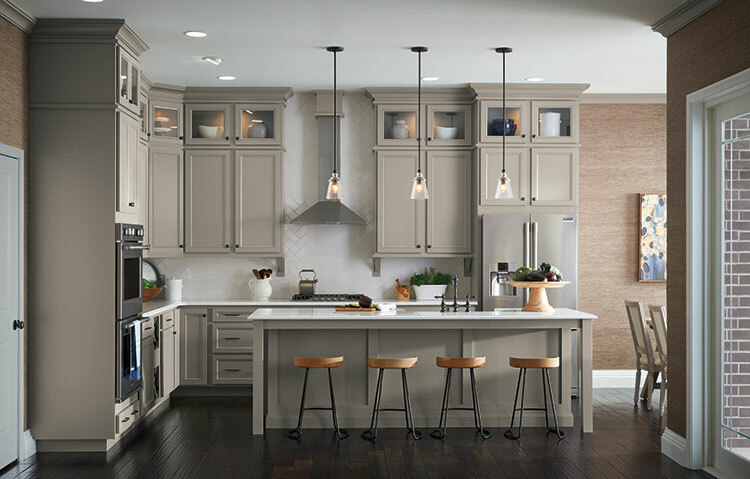 For this reason, I’ve been able to narrow down to 5 kitchen cabinet door styles that feel timeless and will never go out of style! Like I said in our Materials Select post, we chose to go with the semi custom line called Diamond because it covered all of our needs: designer-inspired materials and finishes, a wide range of storage solutions, and truly beautiful, quality cabinetry. I’m going to share more about the storage solutions at a later date, but let’s dig into these 5 kitchen cabinet door styles a bit further! I absolutely love how modern and sleek the Graniti cabinet style feels! The slab door shape is accented with a specialty laminate that is actually textured to mimic the texture of a fully wooden cabinet door. It’s available in 3 finishes, but the mid-tone called Wharf really spoke to me. This kitchen cabinet would be perfect in a modern mountain home or a space with Scandinavian vibes. Be still, my beadboard-loving heart! The Liberty cabinet door style is truly a classic and would be so beautiful in a bungalow or cottage home. The flat front drawer shape makes it feel a bit more modern, as does the mid-tone grey called Juniper Berry. If you want a more traditional look, there are over 20 wood finishes that can be done in either maple or cherry. While I loved this option, I worried that it would compete too much with our tile. It was a tough call deciding between our ultimate choice and the Leeton. The subtle detail of the additional trim in the center of the cabinet tool really stood out to me as a beautiful option for our home. I also loved the wide range of 38 colors from which to choose. Actually, the more I think about it, the more this style feels like a good mix of the Sumner and the Liberty cabinet styles… sort of like they had a baby! Plus, how beautiful is this color? It’s called Tidal Mist. Most of the options we considered featured a flat-front drawer, but for Shiloh I love how it looks with a 5 piece drawer. This classic kitchen cabinet style is a really great option for most homes, to be honest, because it’s so versatile. I can see this working in a more contemporary home or in a traditional one equally well. Cabinet style 5: Sumner — the one we chose for our kitchen! Ta Da! This is our cabinet style for our renovation! The Sumner is essentially a Shaker style frame with clean, sleek lines that feel totally perfect for the style of our bungalow and Sarah’s design plan. 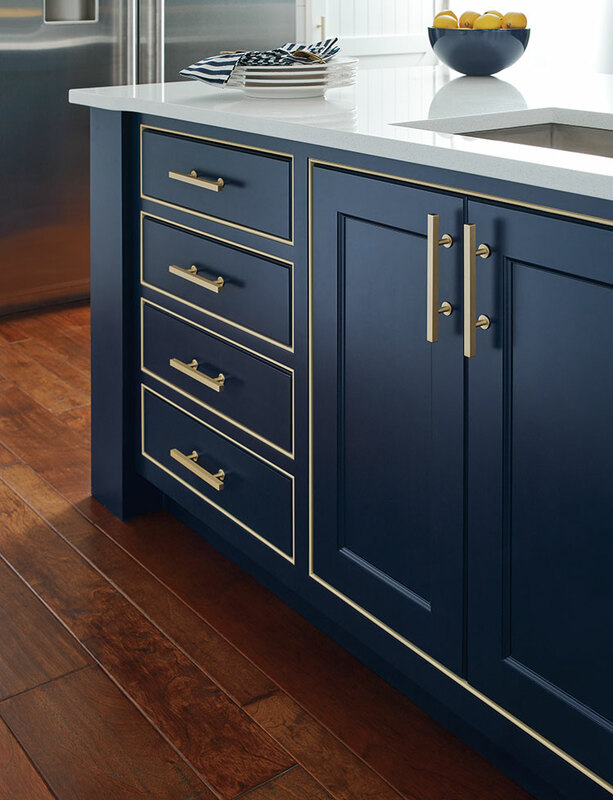 While wood grain is gorgeous, we wanted painted cabinetry for a modern feel. We are going with white upper cabinets and black lower cabinets, but we’re still deciding between the flat front for the drawer or going with a 5 piece. I am leaning toward the flat front drawer because that would give us a bit more wiggle room to get creative with our hardware selection. I’d love to know which of these kitchen cabinet door styles is speaking the most to you! Be sure to let me know down in the comments. Images courtesy of MasterBrand Cabinets, used with permission.